بني في , Ibis Styles Katherine Hotel هو ميزة مُضافة لـ كاثرين و خيار ذكي للمسافرين. يمكن من هنا للضيوف الاستمتاع بسهولة الوصول إلى كل ما تقدمه هذه المدينة النابضة بالحياة. يوفر الفندق بفضل موقعة الجيد وصولاً سهلاً إلى أهم معالم المدينة.
. كما يقدم Ibis Styles Katherine Hotel الكثير من الخدمات لإغناء رحلتك في كاثرين. إن مكتب الاستقبال على مدار الساعة, مرافق مخصصة لذوي الاحتياجات الخاصة, تخزين الأمتعة, واي فاي في المناطق العامة, صف السيارات هي جزء فقط من الخدمات التي تميز Ibis Styles Katherine Hotel عن باقي الفنادق في المدينة. تتضمن كل غرف النزلاء وسائل الراحة والتسلية المصممة خصيصاً لضمان الراحة القصوى للضيوف. صممت خدمات الاستجمام في الفندق والتي تتضمن حمام سباحة خارجي, سبا, ملعب تنس, حديقة لمساعدتك على الاسترخاء والراحة. استمتع بخدمات لا يعلى عليها وعنوان ذو اعتبار في Ibis Styles Katherine Hotel . Bathroom all taps needs washer change as taps dripping all night. Exterior needs major clean & bathrooms need renovating. Request deluxe room or u will be disappointed with budget room. Booked through Agoda and had problems with booking. They made it as hard as possible to fix and basically wanted me to lose my money. Facilities average at best. Staff not helpful. 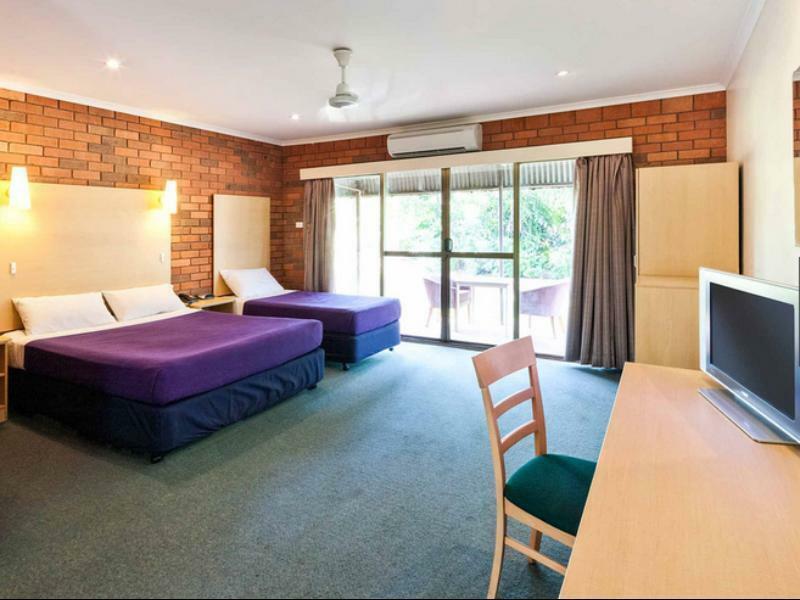 Comfortable rooms, lovely staff, great value for money. Would stay again. I booked the room for my son-in-law because we were having a family get together and my house was small for everyone to stay. I booked the room through agoda and paid for it. Excellent value. I rang the hotel to see if I could pay for it locally but they wanted to charge $110. I got it through Agoda for $81. When my son-in-law turned up to book in, the reception was unattended (430pm in the afternoon) and there were at least 6 guests waiting for attention. The manager was inside but the door was locked. Eventually he opened up. Then proceeded to charge my son-in-law a further $110 even though he presented the Agoda invoice. My son-in-law enjoyed his stay, though reported that the toiletries were a bit stale. ok. it's nothing special it's just a old hotel. It was ok. The rooms are basic, the wifi terrible, breakfast ordinary. The staff were ok. We didn't eat at the restaurant at night. Very good. Great value for the price. Since it was out of season the hotel grounds had a neglected look. The grass was uncut, patios outside the rooms were dirty with numerous cigarette butts & debris. Glass side of shower was cracked & bulging. Rooms although spacious looked in need of an update. Failed to connect to internet. Breakfast was adequate but restaurant was closed. 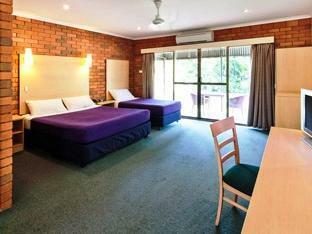 The hotel recommend my friens who stay there offen when the passing from Kalkingi to Darwin. the hotel by Stuart Hwy, We booked a delux room, it was far from the road, it was nice in green, quite. the room is in good size, parking is in front of the motel room, normally charge about $150-$180 per night, but we booked with 50% off hotel rare from AccorHotels.com it is not far to drive - few minute drive to central if you prefer ear out. the hotel has his own restaurant,only to buffet dinner, no choice of meal order. The buffet is about $36 per person, we think a liittle so much as the food just ok. most people stay there with car or tours, it suitable for any ago group. It was good to get to sleep, we had been travelling and very tired, beds were comfortable. The rooms need a complete makeover, its very old and in need of repairs. was way over the top. Big spacious room, plenty of space for a cot and for kids to play. Good breakfast and friendly staff.